Being released at the Outdoor Show in Friedrichshafen is a new version of the Petzl Grigri, the Grigri+. It’s a beefed up Grigri, which looks to have been designed with adventure parks, outdoor centres and places or occasions where the standard Grigri takes a hammering, in mind! 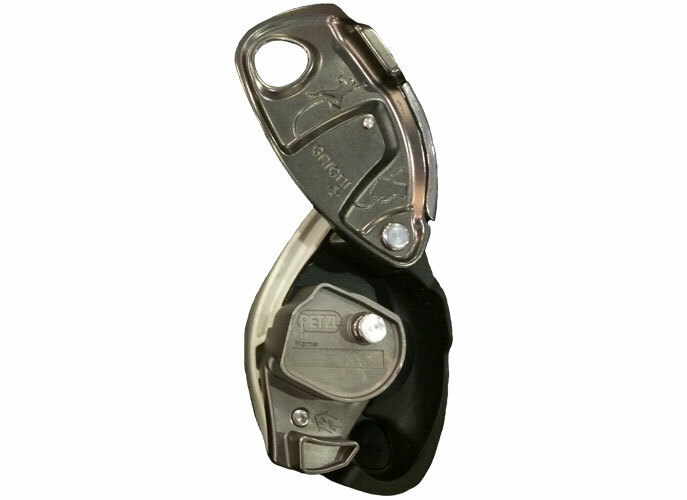 An anti-panic function where the device locks if the handle is pulled hard in panic (same clever system as found on Petzl’s most popular industrial descender the Petzl ID Descender). The anti-panic features (let go of the handle and the device locks, pull too hard on the handle and the device locks) also makes it more suitable for novice climbers who may be tasked to belay their buddy at a park or centre. 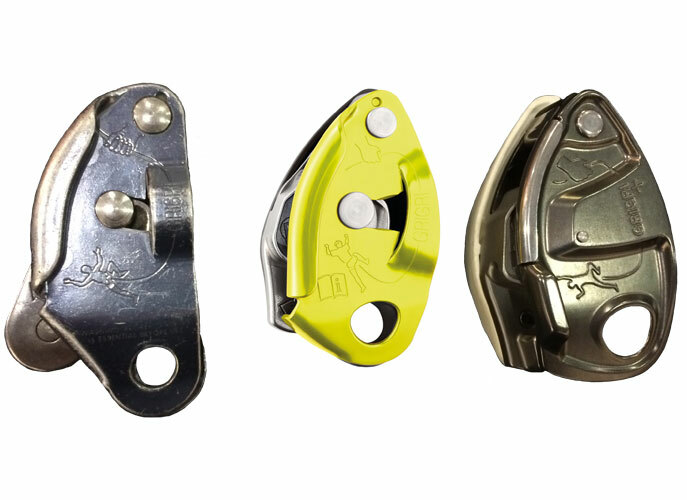 A patented switch which allows the user to change the Grigri set up to alternate between lead climbing and top roping (a knob on the reverse of the device loosens / tightens a spring to make it easier / harden to pay out rope). A stainless steel protector place on the inside of the front plate to give more protection against the wear of the rope against it. A wider space between the cam and body allowing more space for the rope to pass through and help reduce the wear on the device from ropes that have become furry over time (note that the maximum rope diameter is still marked as 11mm). 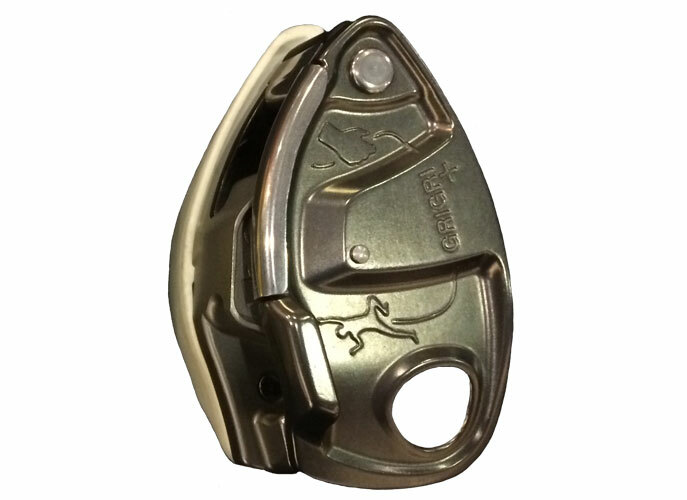 Small design tweaks from the standard Grigri also include the front plate central locking rivet now locking into the underneath of the front plate rather than through, and the section of the Grigri which guides the rope through the belay device at the climber end of the rope is more substantial and forms part of the main body rather than being part of the front plate. Available in 2017, the Grigri+ is likely to retail at £85. Following the discovery of missing structural sewing on a DMM Brenin Harness during a routine inspection by an end user, we are issuing the following information to users of all DMM harnesses, and asking them to carry out a visual inspection on the key structural sewing on their harnesses. This is the first instance of this product fault in the history of DMM harness production. As both the manufacturing and quality control processes on the Brenin are shared with our other harness models, we feel that issuing a precautionary instruction advising climbers to check all DMM harnesses is the appropriate response. Upon notification of the missing structural sewing, DMM immediately initiated a full investigation and quality control audit on harness production, carried out a 100% re-inspection of all harness stock, and are now issuing this request for user inspection. How was the missing structural sewing found? The missing bar tack was found by a customer during a routine equipment inspection. It is important to note that no harness failures, accidents, or injuries have occurred. DMM were informed, a full investigation was carried out. Corrective and preventative measures have been implemented. What is the effect on strength? The bar tacks are the main structural stitching on a harness. Depending on the style of the harness, there is often secondary stitching with a certain level of strength. With a bar tack missing, the harness breaking strength will be reduced. The returned Brenin harness was subjected to a full torso harness test in accordance with the European Standard EN 12277 and withstood 15kN loading without failure. What harnesses are potentially affected? In the past decade, several hundred thousand harnesses have been produced and sold by DMM, with the current harness return being the first occurrence of missing structural sewing. This request applies to all DMM harness styles still in service, no matter the age. We feel it is important to spread the net far and wide to ensure we reach as many end users as possible, raise awareness, and maximise user safety. Only by adopting this method will DMM and the climbing market be 100% reassured. What is a ‘Request for User Inspection’? This is a process used to proactively raise awareness of a potential product issue and to determine its scale and scope. As the presence of structural sewing is easy to inspect (using the Harness Inspection Sheets), it is possible for the users of our equipment to identify any faults. This helps us to ensure that this issue is not widespread, that maximum levels of safety are maintained, with the minimum of inconvenience for climbers. This is not a recall. A recall occurs when there is evidence of a widespread product issue with associated safety concerns. What happens if missing structural sewing is discovered? If your harness is missing the structural sewing, stop using the harness, quarantine, and contact DMM directly as per the instructions on the Harness Inspection Sheets. What if I’m not 100% confident in my inspection? If you have any doubt, please email returns@dmmwales.com We will be happy to help you get to the correct conclusion. As always with PPE it is important to be 100% confident in your equipment. What steps are DMM taking to make sure this can’t/won’t happen again? 100% Re-Inspection of all DMM harness stock. A full investigation and audit of the harness quality control and manufacturing systems is underway. Process improvements will be implemented. For full information and inspection click here or visit our Facebook page. Latest update for the release date of the much anticipated DMM Revolver Rig is September 2016. As ever with new products, release dates are flexible! As soon as we know the price then forward orders will be welcomed. The Revolver Rig will be available with a choice of gate options: screwgate, triple action (lift, twist & pull to open) and four way (twist, lift, twist & pull to open). 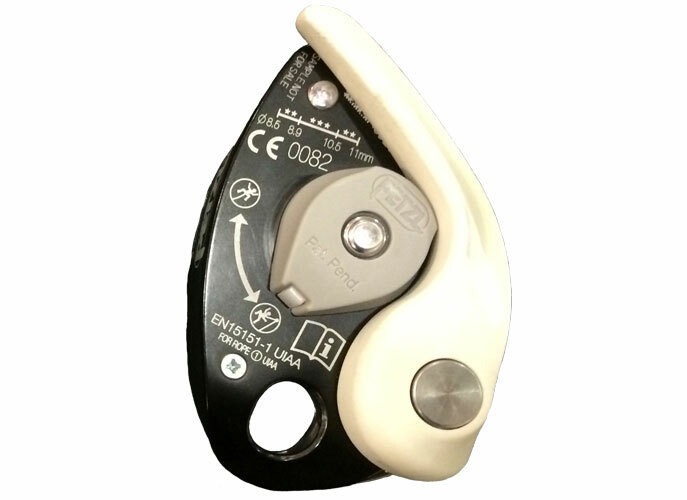 The Revolver Rig features an integrated pulley wheel, small becket and a ‘horn’ (which is designed to limit the risk of side-loading the connector when it is used with a belay device such as a Petzl Grigri).